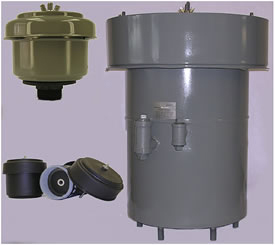 The combination of oil scrubbing action and baffle impingement principles provides exceptionally high dirt arrestment. Laboratory tests with various types of dust show efficiencies ranging from 95.4% to 98.6%. Unscrewing a wing nut permits complete disassembly of filter for inspection or cleaning. To clean filter, empty dirty oil from sump and replace with clean oil (SAE 10 to 30 in cold weather, SAE 30 to 50 in hot weather). Filter element may be removed and cleaned if dirty. 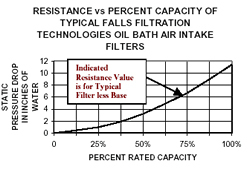 The resistance graph at left is of a typical Falls Filtration Oil Bath Filter (less base) showing an increase in pressure drop as the percentage of rated filter capacity increases. More filter area per capacity results in much lower air resistance through Falls Filtration Technologies filters. While conventional filters utilize only the filter area equivalent to the base of a cylinder, Falls Filtration Technologies employs the entire cylinder wall. In the case of a cylinder 5” O.D. by 8” high, base area is only 19.63 sq. in., whereas area of cylinder wall is 125.66 sq. in. – more than 6 times as great. Actual pressure drop through a Falls Filtration Technologies oil bath filter depends on size of mounting base used and percentage of total filter capacity used. Resistance on average Falls Filtration Technologies filter application ranges from 3” to 5” water gauge. Because of basic design, Falls Filtration Filters offer greatest installation flexibility. They may be mounted directly on top of, or suspended directly from the intake pipe. When used with a mounting bracket, they can be placed in a remote location and air piped from the cleaner to the intake. The wire mesh element cannot pack down or change density. There is nothing to break off and enter the air stream. Metal construction resists vibration and affords complete unit integrity.